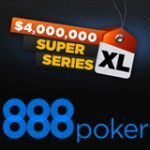 The $10,000 Daily 888Poker Winter Giveaway Freerolls have been extended for another whole month, players can win their share of the massive prize pool everyday until 4th February. 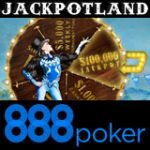 Players need a 888 Poker Winter Giveaway Freeroll tournament ticket to register for the restricted event, qualifying is easy just hit trip 888's on the poker tables for your entry. New players can get a free tournament ticket when signing up to 888 poker, no deposit required. Make your first deposit of at least $10 and get an additional 5 tournament tickets to play for their share of $50,000 in prize pools. The 888 Poker Big Bang promotion is also running and offers more than $50,000 in cash and prizes on the cash game tables. 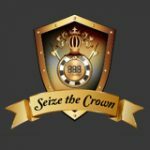 888poker host the best free poker tournaments with several ways to get your tournament ticket to the popular daily freeroll. 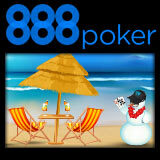 Register for the Winter Giveaway Freeroll by clicking on Tournaments>All in the 888poker lobby. Get one free tournament ticket, no deposit required. New players can get 5 more tournament tickets by simply making their first deposit of at least $10 to qualify. 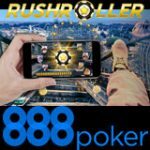 Players that have already signed up to 888poker will be sent an email with a link to claim their free tournament ticket. 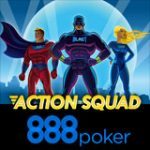 All 888poker players can earn one tournament ticket everyday by hitting trip 888's and playing it to showdown in any real money tournaments, SNG or cash games. Players can use these tournament tickets to register for any of the 888Poker Winter Giveaway Freerolls during the promotional dates. Tournament tickets are issued within 72 hours of qualifying with a Three-of-a-Kind 8 hand. The freerolls can be played on just about every platform available: PC, MAC, iPad, iPhone or Android devices. Players can access their tournament tickets by clicking on the tournament ticket button which is located just above the cashier button in the 888poker lobby. 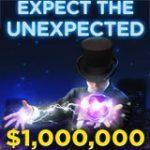 The free $88 bonus offer is only available to players who reside the following countries: Australia, Austria, Brazil, Canada, Cyprus, Finland, Germany, Greece, India, Hungary, Ireland, Japan, Kuwait, Lebanon, Luxembourg, Malta, New Zealand, Netherlands, Norway, Poland, Russia, Singapore, Slovenia, South Africa, Switzerland, Sweden and Ukraine. UK poker players get £12 free when signing up at 888poker, no deposit is necessary.